How are Mathematics and Physics Intrinsically Connected? Your contributions will help fund Dr. Lapidus’ continued research in understanding fractal geometry underlying physics, and its vast connections to mathematics and science. Costs include $100K-$150K/per year to support his research program for an expected five years. Your funds support students and postdocs, support personnel, publications, equipment, travel, equipment, and research workshops. Play a role in developing important mathematical theories that have wide implications; fund Dr. Lapidus. Imagine someone playing a drum. Another person sits a few yards away and tries to guess the shape of the drum just by listening to its music. How can the drum’s shape be identified in such a way? The drum has an intricate and wrinkled shape at all scales, which makes it a ‘fractal’ drum. Fractal geometry measures and defines rough shapes—in contrast to the smooth circle or square—that iterate in nature. Examples of fractal structures include clouds, lungs, trees, river beds, coastlines, mountain ranges, blood vessels, rainfall and many other natural objects. Dr. Michel Lapidus, Professor of Mathematics and cooperating faculty member in the departments of Physics and Astronomy and of Computer Science and Engineering at the University of California, Riverside, is a theory-builder who studies the mathematical and geometrical structures that underlie physics, as well as the complicated geometry that arises in nature. 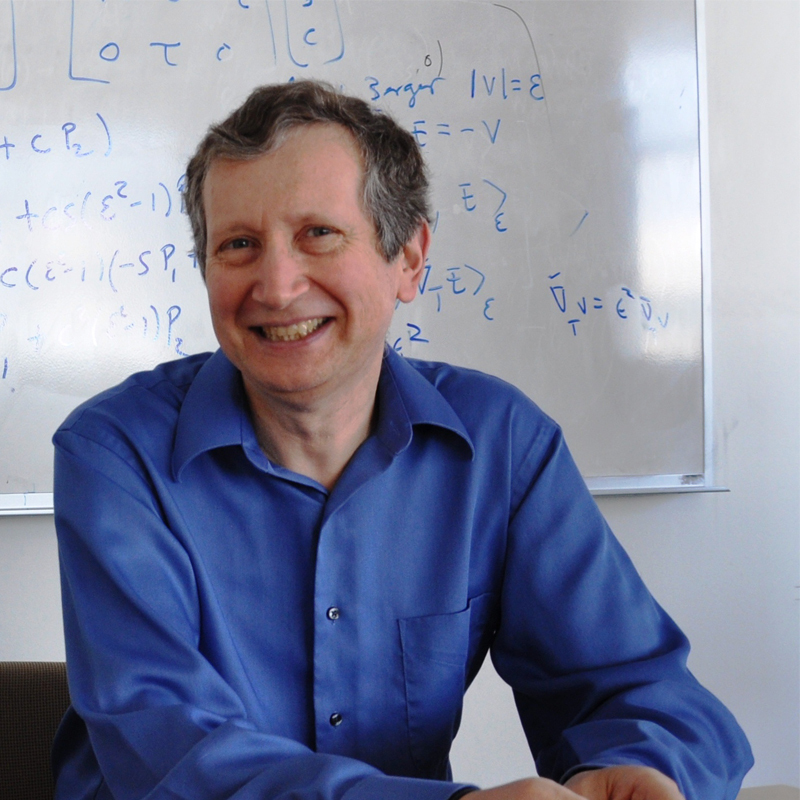 His highly-cited interdisciplinary work has a significant impact on various branches of mathematics and scientific disciplines, including physics, biology, chemistry, geology, engineering, scientific computing, and computer science. Dr. Lapidus’ novel theories—including his development of complex fractal dimensions—often serve as a motivation for physical experiments and numerical computations aimed at verifying certain physical phenomena. It provides “food for thought” to many mathematicians, physicists and other scientists, by proposing a large number of conjectures and open problems that shine new light on, and build new bridges between, previously unrelated areas of mathematics, physics, and other sciences. His long-term research program—which combines aspects of fractal geometry, mathematical physics, number theory, noncommutative geometry, differential geometry and nonlinear dynamics—uses a variety of models, enabling one to view the same mathematical or physical phenomena from different perspectives. Dr. Lapidus’ research is often motivated by key issues in theoretical and applied physics, as well as by fundamental (and seemingly unrelated) problems within mathematics. Several of his results have resulted in physical and numerical experiments verifying aspects of the proposed mathematical models. Dr. Lapidus collaborates extensively with researchers and former students in the U.S. and worldwide. He works in close collaboration with graduate students, postdoctoral fellows, junior collaborators, and international visitors. He mentors students of all levels—including high school, undergraduate, and graduate students—which earned him in 2012 an advisor/graduate mentoring award for "exceptional contribution to the mentoring and advising of PhD students over the course of a number of years." Together, Dr. Lapidus and his collaborators expect significant advances within five years, during which they will complete several other books and a series of research articles on the resulting theories. Exploring Fractal Structures in Nature - Dr. Lapidus and his team continue to extensively investigate the vibrations of fractal drums (both drums with fractal boundaries and drums with fractal membranes), as well as of wave propagation through rough media. A closely related problem which is of fundamental importance both theoretically, and as it applies to physics, engineering, and biology, is to understand how fractal structures—such as river beds, mountain ranges, networks of blood vessels, lungs, and lightning—arise and are formed in nature. Dr. Lapidus and his team are also exploring multifractal geometries, in which the tapestries of complex dimensions change from point-to-point due to the heterogeneity of the space. This is illustrated in rain falls, ore distribution or clouds, and potentially by certain cosmological structures. Extension of Complex Fractal Dimensions Theory to Higher-Dimensional Fractals - Spanning his work for the past 25 years is Dr. Lapidus’ popular theory of complex dimensions, which connects many fields of mathematics and physics, and has many potential and realized applications in science. Intuitively, and in actuality, complex dimensions provide a very precise way to understand the intrinsic oscillations (frequencies and amplitudes of vibrations) that are inherent to rough geometries like fractal geometry. More specifically, the real parts (resp., imaginary parts) of these complex dimensions are directly connected to the amplitudes (resp., frequencies) of the underlying geometric waves. An entirely similar statement can be made with waves associated with the spectra of fractal objects such as fractal drums. Complex dimensions also provide detailed information about the underlying dynamical systems. Dr. Lapidus and his team aim to expand this theory through the introduction of new ‘fractal zeta functions’ associated with the geometries of arbitrary bounded shapes in space, such as self-similar sets, Julia sets and the Mandelbrot set. Ultimately, the theory aims to blend together many aspects of geometry, number theory, analysis, and physical intuition, enabling the precise descriptions of oscillations in the geometry, spectrum of fractal strings, and other fractal shapes. Developing Calculus and Geometric Analysis on or off Fractals - Dr. Lapidus plans to construct new models of “fractal manifolds” (fractal analogs of the smooth spacetime of general relativity and cosmology) and study their geometric and analytical properties. This project has potential applications in condensed matter physics, aspects of string theory and quantum gravity, cosmology, as well as in the study of a variety of engineering and biological models. Understanding the Mathematical Structure Underlying Physical Reality - Dr. Lapidus and his team work in many different areas of mathematics, including mathematical physics, analysis, harmonic analysis, ordinary and partial differential equations, dynamical systems, fractal geometry, operator theory, noncommutative geometry and operator algebras, arithmetic geometry, and number theory. This work is often motivated by various aspects of theoretical physics, especially condensed matter physics, quantum physics, quantum field theory, string theory, general relativity and cosmology. In turn, the results and conjectures arising in physics and other scientific fields—such as biology and computer science—provide Dr. Lapidus and his team with essential tools in order to tackle the mathematical problems at hand, or develop new mathematical theories. Understanding the Geometry that Underlies Arithmetic - Dr. Lapidus and his collaborators discovered that the vibrations of fractal strings were deeply connected to important aspects of number theory, resulting in some unexpected connections to the Riemann zeta function and the corresponding Riemann hypothesis (the most famous open problem in mathematics). In essence, the Riemann hypothesis states that the prime numbers are distributed as harmoniously as possible on the real line. Riemann’s zeta function and hypothesis encode the intrinsic oscillations and other key properties of prime numbers, which are the building blocks of arithmetic and therefore, of all of mathematics. Additionally, they have shown the occurrence of several mathematical phase transitions—similar to the physical change from ice to water—in the shape of the spectrum of an operator naturally associated with the vibrations of fractal strings. Moreover, they have established its “universality”, thereby showing that it is chaotic and can, in principle, reproduce a variety of complex behaviors. Dr. Lapidus is currently completing a research book on the understanding of this theory. Since childhood, Dr. Michel Lapidus has been interested in a wide range of creative activities and interests, including literature, history, mathematics, physics, and biology. At the end of high school, he was admitted to the best school in France (and in the French-speaking world) in both the literature and mathematics programs. He chose the latter with the intention of doing research in biology. However, shortly afterward, Dr. Lapidus decided to pursue research in mathematics, as well as in theoretical and mathematical physics. He was especially interested in quantum mechanics and special and general relativity, in addition to broad aspects of analysis, geometry, mathematical physics and number theory. His first research memoir, just prior to his thesis on problems in pure and applied mathematics, as well as in mathematical physics, was investigating the large-scale structure and topology of spacetime. In addition to its roots in pure mathematics, it was directly motivated by problems in cosmology and astronomy. For Dr. Lapidus, mathematics has always been a passion that never subsided. He sees the beauty and poetry of mathematics as unmatched, except perhaps by the greatest pieces of classical music. Dr. Lapidus’ current research program stems from discoveries in his past work. During his first decade as a researcher, Dr. Lapidus further developed many aspects of the mathematical theory of Feynman path integrals and Feynman’s operational calculus, which are of fundamental importance in theoretical and applied physics, in order to understand the nature of quantum theory and the standard model of elementary particles--topics that were explored extensively in his Oxford University Press (joint) books "The Feynman Integral and Feynman's Operational Calculus” (2002) and “Feynman’s Operational Calculus and Beyond” (2015). The works of the famous physicist, Richard Feynman of Caltech, as well as many discussions with him on the foundations of physics, inspired aspects of Dr. Lapidus’ research on this subject. After having read Benoit Mandelbrot’s attractive book, “The Fractal Geometry of Nature” in the mid-1980s, Dr. Lapidus became extremely intrigued by this new field of mathematics. However, he was dissatisfied with Mandelbrot’s definition of fractality but fascinated by the beauty and potential scope of applications of the subject. This eventually motivated Dr. Lapidus to develop his theory of complex fractal dimensions, which has been at the center of his research for the last 25 years. At the fundamental level, Dr. Lapidus believes that the nature of the mysterious geometry which underlies number theory, as well as that of fractal geometry and spacetime geometry, are deeply connected. The theory of complex dimensions has aimed to resolve this enigma and provide many different bridges between various levels of mathematical and physical reality. Dr. Lapidus has written extensively about this theory in a number of papers and books, including his book/essay “In Search of the Riemann Zeros: Strings, Fractal Membranes and Noncommutative Spacetimes” (2008), published by the American Mathematical Society, and his (joint) research monograph “Fractal Geometry, Complex Dimensions and Zeta Functions: Geometry and Spectra of Fractal Strings (2013, 2nd. revised and enlarged edition of the 2006 edition), published by Springer. Dr. Lapidus is the director (and founder since 2010) of the “Institute for the Applications of Mathematics and Integrated Science’’ (IAMIS) at his institution. He and his team organize mathematical and multi-disciplinary regional, national, and international research workshops and conferences in a variety of venues, including IAMIS. These scientific events are highly beneficial to a broad cross-section of outstanding students (at all levels), postdocs, as well as junior and recognized scientists and mathematicians.